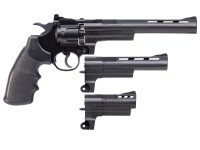 Classic revolver fans will love the new Triple Threat from Crosman! Powered by a single 12 gram CO2 cartridge, this revolver kit comes with three barrels that are easily interchangeable. This not only allows the user to make the pistol their own, but also provides the ability to change the performance of the pistol quickly and easily. Capable of shooting .177 caliber pellets or BBs, attach the included 3", 6" or 8" barrel and go to town. Each barrel is fully rifled, providing repeatable accuracy. The adjustable rear sight allows you to zero in on your target no matter the projectile or barrel being used. With the 8" barrel, users can expect velocities up to 465 fps with alloy pellets and 425 fps with BBs. When is it available June or March ? Includes 3, 6, and 8 inch barrels, 10-shot pellet clip, and 6-shot BB clip.